Ginger died this week. She was not easy to love. Wild, wary, aggressive. She had a lot of anxiety. I could identify. We got Ginger to be a companion for Cooper. Sweet, sociable Cooper. Cooper was a baby when we got him and he bonded with us for the year that he was on his own. He hung out on our shoulders and our heads, climbing all over our eyeglasses, happily exploring his surroundings, making our world his. Cooper was the substitute for the dog that my children really want. My husband stubbornly refuses a dog. We think he is selfish and overly consumed with not wanting a dog peeing on our rugs. The secret truth is that he can’t stand loving and losing a dog. He can’t stand not being able to properly take care of dog. He loved and lost a dog before and doesn’t want to do it again. Who’s to say that he is not the more selfless and compassionate human in our family? So, we got Cooper. And fell in love. And fear his loss. All my guilt about not taking good care of the pets I had as a child resurfaced with Cooper. I dream frequently about Cooper, worrying about him, a stand-in for my worries for all the people I love. This time, I was going to be a good pet-owner! I read the books. We got a nice cage, but let him fly freely when we were home. I memorized and avoided the list of poisonous foods and carefully gave him healthy dark leafy greens to supplement his diet. He chirped happily. All the time. A member of the family. We wondered if he was lonely when we were at work and school. He didn’t seem lonely or unhappy, but all the books said that parakeets are very social and want to flock with other birds. My husband joked that we were his flock. Still. We wondered. After a year, we decided to get another bird as his companion. The store warned us that his attachment would shift from us to the new bird. We wanted what was best for him. 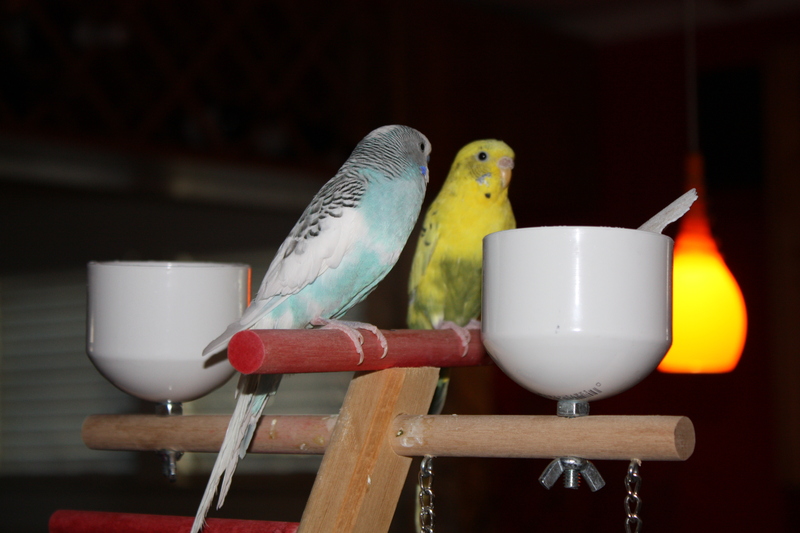 We observed the latest crop of baby parakeets. A pretty yellow female caught our eye and we brought her home. Ginger. The second Cooper saw her he squawked with excitement. He was thrilled! We introduced her slowly and they seemed to attach and bond. But Ginger never bonded with us. She learned to tolerate us, but was never particularly comfortable or happy with us. Cooper gallantly protected her from us and showed her the ropes. She became the alpha female. Demanding her spot, her food, her toy. Cooper just wanted her to be happy, as did we all. She never seemed happy. One pet shop showed me anti-anxiety drops for animals. Really? That seemed extreme. But it was crystal clear to me that different animals have unique personalities. Unique souls. When I look Cooper in the eye, he looks right back at me, with his soul shining through. More and more I question, how can I eat an animal? Obviously, I am not going to eat Cooper, but don’t all animals have souls? Look an animal in the eye and tell me what you see. I see another being as alive as me. A week ago, Ginger started making a squeaking noise and we wondered if she was finally beginning to tame and find her voice. She started sidling up against Cooper to be close to him instead of squabbling with him or scolding him away. I wondered if she wanted to mate. It occurred to us that she might be ill, but we were busy busy busy and chose to deny the signs and hope for the best. The day before she died, I woke them to find her huddled so close to Cooper he couldn’t move. The day she died, I offered her Reiki, sensing, like Miss Clavel, that something was not right. My husband found her and called me. I knew something was wrong. I steeled myself for bad news, praying my children were all right. After imagining the worst, I was almost relieved when he told me it was Ginger. Sad, but accepting. When he told my son, my husband sobbed the news to him. It is my son’s deepest desire to have someone younger and needier than him in the household that he can love and take care of. It is my son’s yearning for a dog, a pet, that led us to Cooper and Ginger. Telling him of her death brings up our own love for our son, our own guilt at not doing better by these little animals we take on (selfishly? ), our own mortality. We are fearful that Cooper might get sick or depressed at Ginger’s loss. So far, he seems healthy and as happy as can be. He has reverted to his human flock, hanging out on our shoulders and chirping happily. Cooper is easy to love. We buried Ginger in the back yard. A quiet moment. Good-bye Ginger. I am sorry you did not have a happier life. Perhaps it was not meant to be. I hope you are flying freely now.